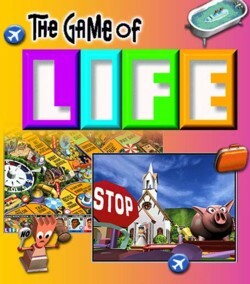 The Game of Life download edition is The Game of Life board game come to life! It has two ways to play, along with a ton of cute animations. I recommend playing the Enhanced game, as it plays just like Classic, but better. 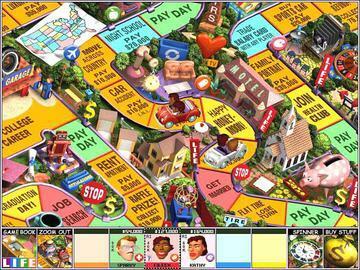 Like in the board game of Life, your first decision is if you will go to college or not, with the same consequences for your choice as in the regular game. When it comes time to choose a career, you will pull a slot machine to determine your fate (one option for those without a degree and three for Ivy Leaguers). Then randomly punch up to three buttons on a register to pick your salary. The PC game plays out just like the regular one in that you will travel around the (massive) board, encountering life events along the way. You start in the 1960s and drive through the decades up to 2000 at a steady rate. With each new set of years you pass through, the music on your car’s radio will change to reflect that era, which is pretty cool. 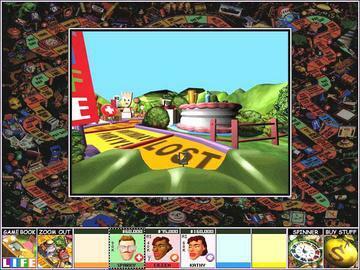 The main spaces to be concerned with the board game Life are the Life tile spots and Stop signs. When you land on a Life square in the Enhanced Game, the milestone is read and you go on to play Life’s Little Games instead of getting a Life tile. You spin the wheel for instant cash or a fun mini-game to win cash. Stop signs, on the other hand, are those times you’re forced to come to a halt to buy a house, get married, etc. Your spouse from your arranged marriage will join you in the car, as well as any subsequent babies. The worst thing about this game is that the graphics look dotty and kinda dull. They were fresh and exciting back in 1999 before I really had gotten into any games, but now in 2008, you can tell they’re old. My other bone to pick about Life in general is that it is quite random with very little strategy involved. Besides the obvious tips and tricks like choosing the highest available salary, being the police officer if you’re able, etc., your game is already predetermined based on what you spin. The endearing extras of The board Game of Life PC make the randomness fun, though. Fans of the board game Life couldn’t ask for much more from this near-perfect edition. The wacky animations and extras in The Game of Life PC version will be welcomed by almost everyone, as they don’t distract from the game, but make it better.